The Great Wall of China is one of the oldest, largest, and most celebrated achievements of human ingenuity, but there are still a few things you might not have known about China’s ancient landmark. 1. BUILDING THE WALL TOOK MORE THAN 1800 YEARS. The Great Wall wasn’t the first fortification erected in Chinese territory to protect citizens from foreign invaders. As far back as the 8th century BCE, barriers were going up to repel nomadic armies. When Qin Shi Huang seized power of a collection of neighboring principalities in 221 BCE and kicked off the Qin Dynasty, he began construction on a 5000-kilometer wall to safeguard his territory. Later dynasties continued this work and added their own flourishes. While construction began under the Qin Dynasty, the recognizable segments that we think of when we visualize the Great Wall were largely the handiwork of the Ming Dynasty, which created these facets between the 14th and 17th centuries CE. 2. THE STRUCTURE ISN'T ONE CONSISTENT WALL, BUT A COLLECTION OF WALLS. There’s a pervasive misconception that the Great Wall of China is one long uninterrupted structure. In fact, the Wall is more accurately described as a 20,000-kilometer network of walls spanning the northern border of Ancient and Imperial Chinese territories. 3. A SURPRISING INGREDIENT CAN BE FOUND IN THE WALL. The Great Wall is largely crafted from unremarkable building materials like earth and stone. More interestingly, glutinous rice—known colloquially as “sticky rice”—was incorporated into the mortar recipe thanks to its cohesive properties. Modern studies have indicated that the amylopectin of the rice (the same substance that makes it sticky) helps explain the wall’s strength and endurance. 4. WALL CONSTRUCTION WAS A COMMON PUNISHMENT FOR CHINESE CONVICTS. 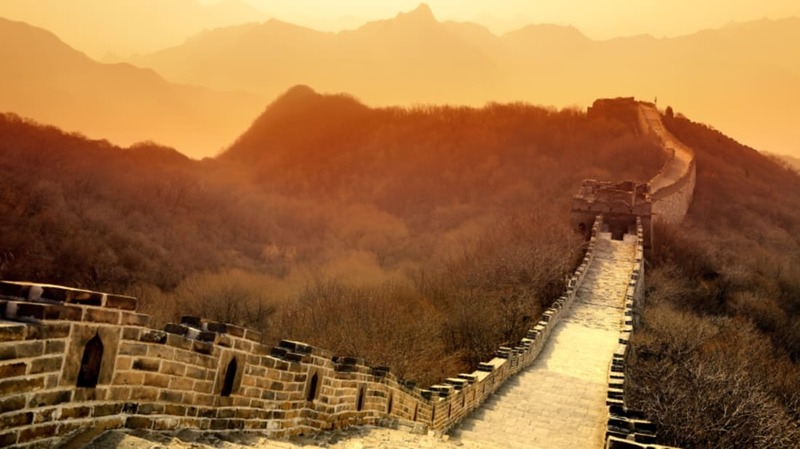 In a particularly extreme version of modern community service, Great Wall construction, maintenance, and surveillance were regular duties of convicted criminals during the Qin Dynasty. To distinguish outlaw laborers from their civilian colleagues, authorities shaved working convicts’ heads, blackened their faces, and bound their limbs in chains. Transgressions ranging from homicide to tax evasion were all punishable with Wall duty. The work was dangerous—some estimates state that 400,000 workers perished while building the wall. 5. ROOSTERS WERE BROUGHT TO THE GREAT WALL TO HONOR THE DEAD. With so many lives lost during construction, grieving family members feared that the spirits of their loved ones would be forever trapped within the structure that cost them their lives. In an effort to grant deceased laborers spiritual emancipation, a mourner would cross over the Wall with a rooster in tow. This tradition was believed to help guide a soul away from the fortification. 6. AN ANCIENT POEM PREDICTS CONSTRUCTION OF THE GREAT WALL. The Shijing, a collection of Ancient Chinese poems written between the 11th and 7th centuries BCE, predicts proper construction of the Great Wall of China with an entry describing a king’s efforts to fend off military invaders via development of a defensive barrier. 7. THE WALL PAYS TRIBUTE TO MYTHICAL AND HISTORICAL FIGURES. Lining the Great Wall are shrines and tributes to figures from Chinese history. Guan Yu, a third-century general who served during the Han dynasty, is honored with temples built on the Wall. Additionally, various points on the Wall pay homage to Tiānwáng, the Four Heavenly Kings of Buddhism. 8. THE WALL WAS NOT THAT GREAT AT KEEPING OUT INVADING FORCES. Despite all the effort that went into making Great Wall the premiere component of China’s military defense system, many of the country’s varied enemies throughout history managed passage across the barrier. Manchurian invasion through the Wall in the 17th century resulted in the fall of the Ming dynasty. 9. HISTORICALLY, OTHER CULTURES HAVE BEEN FONDER OF THE GREAT WALL THAN CHINA HAS. China’s celebration of the Great Wall as a tourist draw and landmark is a relatively recent phenomenon, having only blossomed in the 20th century as a result of international interest. China first took note of the Wall’s wide appeal in the 19th century, following its engagement in relations with other Asian and European countries. Travelers and merchants returned to their home countries with stories they translated into art and print, creating an enchantment with the Great Wall that helped spark Chinese appreciation for the structure. 10. PEOPLE HAVE BEEN EXAGGERATING FOR CENTURIES ABOUT THE WALL’S VISIBILITY FROM SPACE. Despite numerous accounts to the contrary, the Great Wall of China’s reputation for extraterrestrial visibility stands strong to this day. One good sign that this claim is specious lies in the fact that it dates back two centuries before mankind mastered space travel. English scholar William Stukeley outlined the idea in his Family Memoirs, written in 1754. The myth got a boost from journalist Henry Norman’s 1895 book The Peoples and Politics of the Far East, as well as in a 1932 Ripley’s Believe It or Not! cartoon strip. More reliable sources—astronaut Neil Armstrong among them—assert that the Great Wall is by no means visible from space, much less the moon. At best, the Wall can be spotted from a low orbit, sunlight and weather permitting. 11. THOUSANDS OF MILES OF THE ORIGINAL GREAT WALL HAVE DISAPPEARED. Today, the surviving elements of the Great Wall of China stretch to a whopping 13,171 miles. Impressive though the measurement may be, it’s quite a decrease from what is believed to be the Wall’s peak length during the Ming dynasty. More than 1200 miles’ worth, or approximately one third, of the construction from this period no longer stands. 12. PIECES OF THE GREAT WALL WERE RECYCLED TO BUILD CIVILIAN HOMES IN THE 1960s AND 1970s. During the 20th century sociopolitical movement known as Great Proletarian Cultural Revolution, the Chinese government did quite a bit of damage to the Great Wall. Mao Zedong and the Red Guard recognized the Wall as little more than a relic whose materials would better serve in the development of contemporaneous housing. Between 1966 and 1976, miles of the Wall were stripped of bricks and repurposed to build civilian homes. 13. CERTAIN STANDING PORTIONS OF THE WALL MIGHT VANISH BEFORE 2040. Predictions about the Great Wall’s fortitude have grown increasingly dire during the 21st century. Natural weathering and human-imparted erosion may result in the disappearance of certain parts of the Wall before 2040. Portions of the Wall in the Gansu province are thought to be in particular jeopardy. 14. NEW SECTIONS OF THE GREAT WALL OF CHINA ARE STILL BEING DISCOVERED. Previously unknown stretches of the Great Wall have been discovered as recently as 2012. In the past decade, archaeologists have located some of the northernmost sections yet to be identified, standing in and on the border of present day Mongolia. 15. THE GREAT WALL GOES BY MANY NAMES AROUND THE WORLD.